5 Frozen Meals | Breezy Mama Breezy Mama - Expert parenting advice, celebrity interviews, product reviews for kids, moms and babies and more! One words describes these pizzas–DELICIOUS! I tried each variety, and I have no complaints about any of them–although if I had to vote, the cilantro pesto was my favorite. 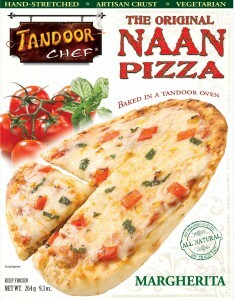 No matter the flavor, each pizza has a hand-stretched, all-natural artisan crust, topped with flavorful toppings, and then fired in a tandoor oven. Yum! For nutritional information, click here. For where to buy information, click here. The kids gobbled these up while the husband and I ate them as appetizers. The potstickers were easy to make (I pan fried them, but they can also be cooked in the microwave) and are just the right size for little fingers to pick up. I served them with a side of white rice and edaname. One word of caution–we finished the entire bag in just one sitting, so make sure you buy two! Click here for nutritional and where to buy information. 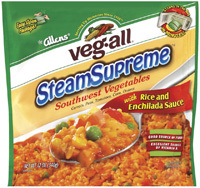 For those of you familiar with veg-all ( a college and camping staple) then you already know about the Allen’s brands. The frozen side dish featured here is rice, with the perfect mix (not too much, not too little) of veggies. You just throw the entire bag in the microwave, and it cooks in mere minutes. The enchilada sauce has just the right amount of kick–it adds spice for mom and dad yet kids can handle it it as well. For nutritional information, click here. 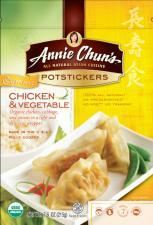 Available in the frozen food section at most major grocery stores. Breezy Mama Christine turned me on to this scrumptious blend. She brought it to our weekly beach barbecue (point–easy to transport) and I was fascinated as she served it up and her kids licked their plates clean. A mix of Israeli couscous, along with red and green orzo, split dried garbanzo beans, and red quinoa, it only takes ten minutes to cook and offers a wonderful texture–a little bit crunchy with a little bit chewy. It can be served as a side dish, or add chicken/shrimp to make it a meal. A piece of advice–although cooking it in water makes it good, cooking it in chicken broth makes it great. Click here for nutritional information. 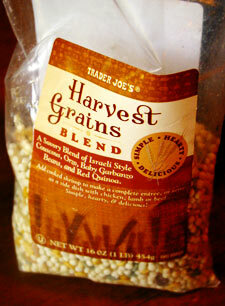 Available at Trader Joe’s grocery stores in the dry grains aisle. I picked these up at my local Costco and split one frozen entree between my son and daughter. 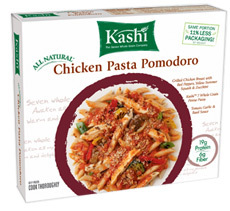 Chicken and roasted vegetables over whole grain pasta and topped with fresh tomato garlic basil sauce, parmesan cheese and Kashi 7 Whole Grain Flakes. It seemed almost too healthy, but no, the dish did not let me down and the kids ate it with gusto. Click here for nutritional and where to buy information. Subscribe to receive Breezy Mama in your email in-box 4 days a week — it’s free! Plus! All subscribers are automatically entered to win a $50 gift certificate to Kinderblis AND two pairs of Pediped Grip n Go or Flex shoes or 3 pairs of Pediped Originals shoes! What are you waiting for?! To enter your email address, click here! LOVE this article! Am always looking for EASY food (semi-prepared is best) for the kids that they’ll eat, like, and is some-what healthy. Does anyone know what chicken nuggets are “healthiest”? For example, what’s better-the Dino Chicken Nuggets or the Mickey Mouse ones from Costco? I think those two are about the same–the Mickey Mouse ones are crispier and cost more–those were the only differences I saw. You could shop at a Henry’s or Whole Foods and probably get something that’s a bit more healthier, but we eat the dino nuggets in our house (which, I’m trying to cut down on! ).